Whole body vibration has been an accepted form of exercise in many gyms and other therapy offices. It is beneficial for several reasons. 1. Proprioception: Proprioception is the system in our body responsible for body awareness in space and time. Proprioception helps us to balance, be able to touch our nose with our eyes closed, and meet someone's hand at the right time for a handshake. When this system is not functioning correctly, our bodies have a decreased ability to coordinate movements and work in our daily lives. 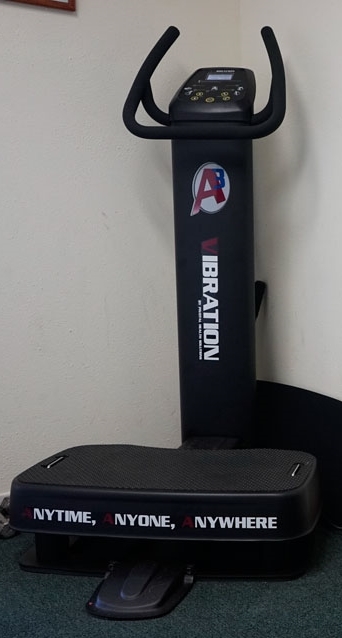 By adding whole body vibration to your treatment regime, we are able to integrate more systems than simply the musculoskeletal system, thereby leaving a longer lasting effect. 2. Muscle fiber recruitment: Standard exercise and rehabilitation programs usually only incorporate movement patterns in one direction (forward, backward, up, down, etc.) When you exercise on the whole body vibration machine, it challenges the body in multiple directions at once. Because the surface is unstable, the body must recruit more muscle fibers to help maintain stability. By adding in multiplanar movements, your muscles will be prepared to take on more difficult activities in daily life. 3. Increased heart rate: Since the body recruits more muscle fibers, the blood supply needed increases. When more blood is needed, it takes less time for the heart to elevate the heart rate. This shortens the time you need to spend working out and increases the efficacy of your exercise. There are many benefits to incorporating whole body vibration to your regular routine. When doing workouts on the vibration machine, your work will be much more efficient and take less time! Call 310-829-0453 to schedule your appointment for a 1 on 1 training session!! !